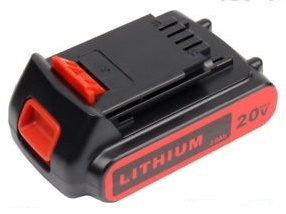 LBXR20 : 20.0 volt 2000mAh Li-ION battery for Black & Decker cordless tools. Replaces battery part #s LBXR20, LB20, LBX20, LCS20, LCS1620. Fits BLACK & DECKER 20 Volt Power Tools such as ASL186K, ASL188K, BDCDMT120, CHH2220, EPL188KB, LCS120, LDX120C, LDX120SB, LGC120, LHT2220, LLP120, LPHT120, LST120, LST220, LSW20, SSL20SB, SSL20SB-2.